This post will explain you about, given integer palindrome or not. 9. \. #  follow by a dot "." 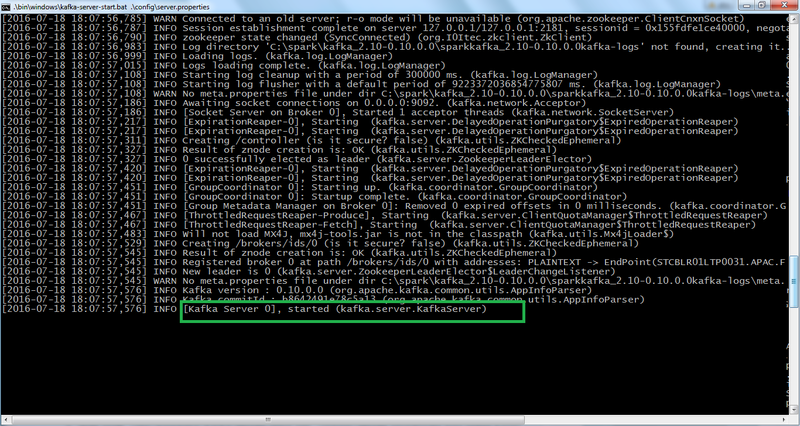 This post will explain you about how to work with apache kafka on windows environment along with zookeeper and java. 1. Download Java latest version and install the same. 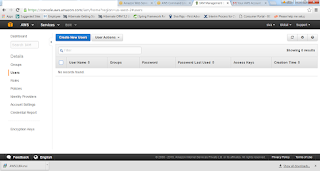 Setup the path variables where our java is installed. 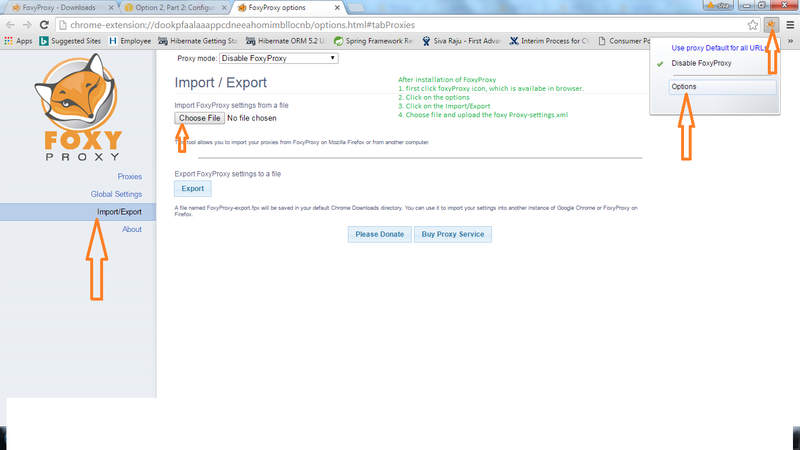 2.Download zookeeper latest version and install the same. Setup the path variables where our zookeeper is installed. 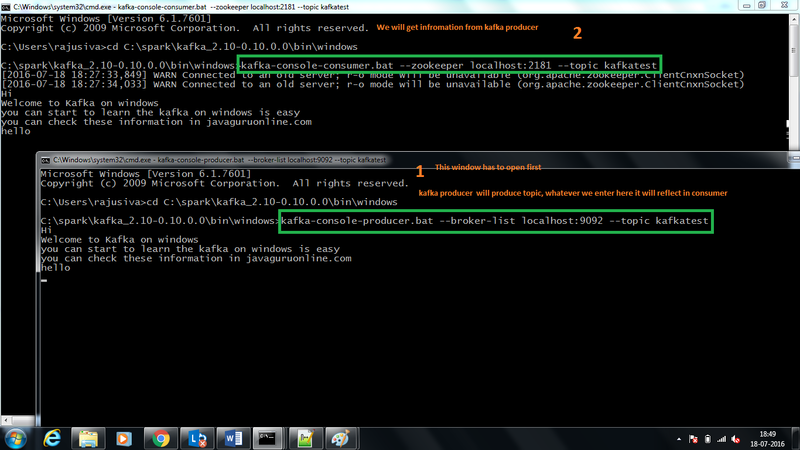 3.Download apache kafka latest version( kafka_2.10-0.10.0.0.tgz) and install the same. 1. Go to confdir, where we have installed our zookeeper. Once Producer and consumer started then, we can start to post messages from producer and reflect in consumer. 1. 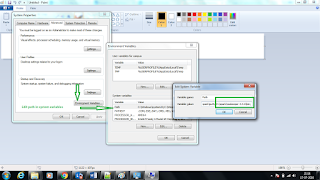 Try to enter some data in producer window, the same data will be replicates in consumer window. Thank you very much for viewing this post. This post will explain you about how to do Optimization in Spark and how to work with closures, Broadcasting and partitioning. How to use Closures in our Spark? 1. Since Spark distributed so variable reference is could not cross node boundary’s. So each partition will get it’s own copy of variables. 2. This happens in outside Driver . So final count will not be updated. c. Then we will do the some more transformations before calling the final collect. This is how spark advanced concepts will work. 3. But we can write the creative code let the engine use as much of data and storage structure as much as it can to optimize the result and distributed query behind the scene. 4. The main goal is developer not worry about distributed nature as much and focus on your business usecases. How we will compare Spark SQL with other competitors? - It very slow and require complex custom user defined functions. - Unit testing is very difficult. 4. Spark can work with many data sources. 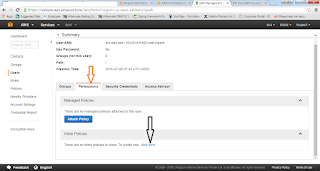 - After this we will have automatically access to the hive administrator. - If we want to access existing table just load it by name. a. New API makes Spark programmes more concise and easier to understand and at the same time exposes more application semantics to the engine. 1. There is unification across the languages and it is influenced by python pandas and R frameworks. 1. We can use sqlContext to work with Spark SQL. How to create class using sqlContext in Scala? How to Load the data from the source? we will get error, since companiesDF and companiesJsonDF schema is in different alignment order. We can cast the required columns with the select. If we use unionAll then both Data frames will be combined. How to convert data into row. How to register the table to run the sql like statements. - We can use hql also for hive tables. 1. It is for streaming the data. 2. It is very popular library and it takes up the spark big data processing power and crunch up the speed. 3. It has the ability to stream GiGa byte data in sec. 5. It can have exactly one transformation schematics’ and failure recovery time as in matter of sec or 2 secs. 6. Due to 1 transformation the transformation output can’t be duplicated. 7. The transformation method itself will execute multiple times on failure. 2. In Storm data can be duplicated. 5. SPARK process the incoming data as a small deterministic batch jobs. This is called micro batching. a. Once we picked the Source then it will flow into Spark Streaming receiver. Where we have one receiver per one stream. b. Behind the scene Streaming incoming data store into series of RDDS with specified windows of time. c. Then each time window it will passed to spark core and it will process as normal. d. So our stream becomes series of RDDS. 1. 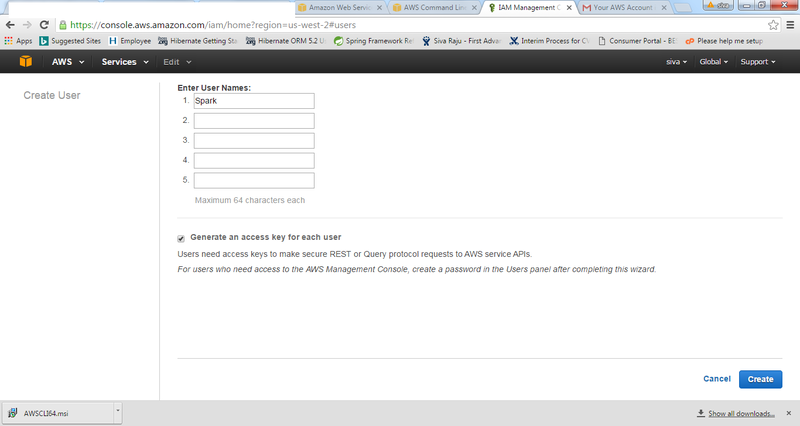 First we need to get access for twitter API. 3. Please refer my previous posts, how to create app in twitter. 4. Provide key details in build.sbt file. 1. This is very complex library. Since it is having complex algorithms. These are easy to use and fairly scalable.  These are more scalable and cost of use.  ML Optimizer and MLI were used for machine learning pipe lines and algorithm development. 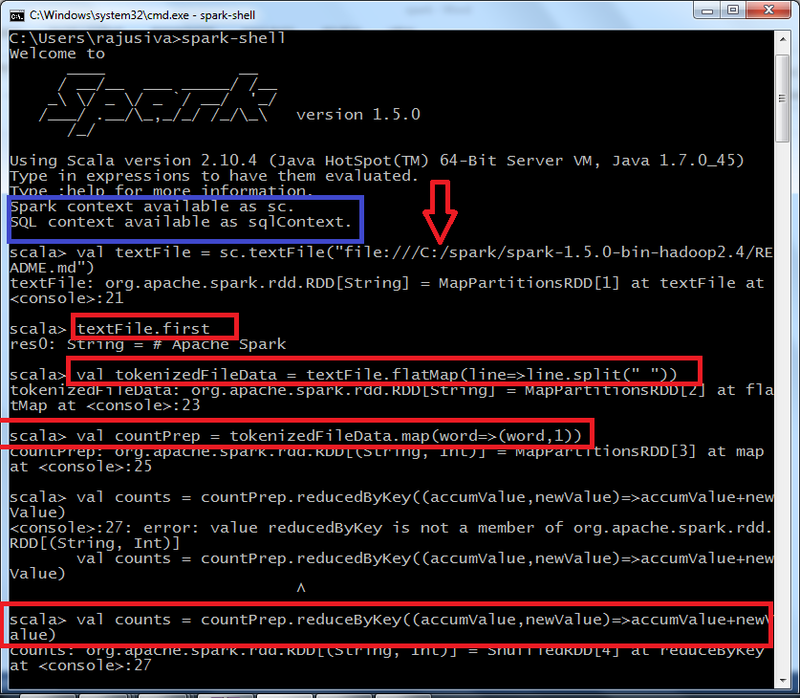  Spark MLlib implementation as assumed most of this stack, with mllib has original based RDD algorithms reside.  These ML pipelines officially introduced into the Spark 1.2 as attempt to simplified machine learning.  In machine learning flow and loading the data , extracting features , training the data and testing the data. 1. It is a library that brings table structure into grapgh like structure. Like social networking. 3. GraphX works RDD behind the scene. Just drawing the data in graph optimized data structure. 4. 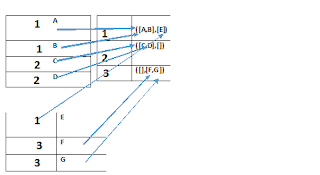 The execution run through this parallel pattern for each node computation depends on each of it’s neighbours. 5. This focus on graph specialization with some impressive performance gain. 1. Try to run graphs on Hadoop is very complex. What kind of things we can do using GrpahX? 3. 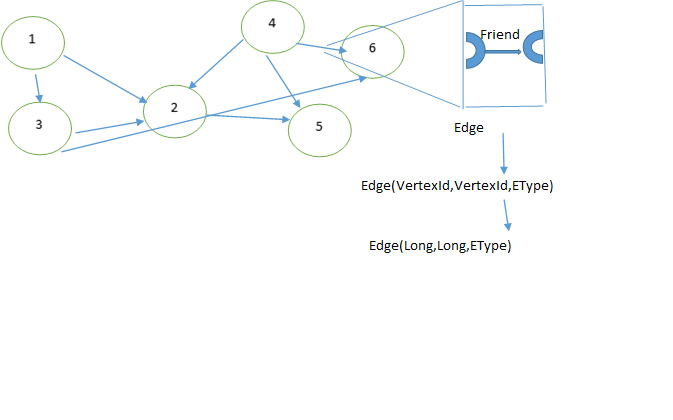 Social network data analysis using Social Graphs available. 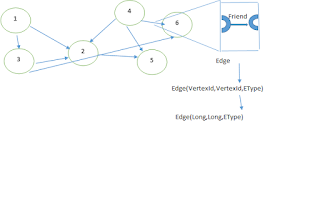 Then we will have Vertex and Edge, then we can build graph like below. 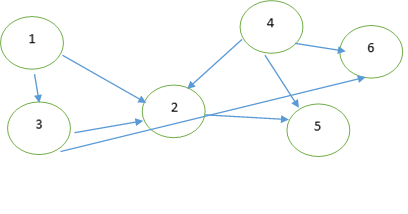 This will provide us on Graph complete view more reasonable understanding. 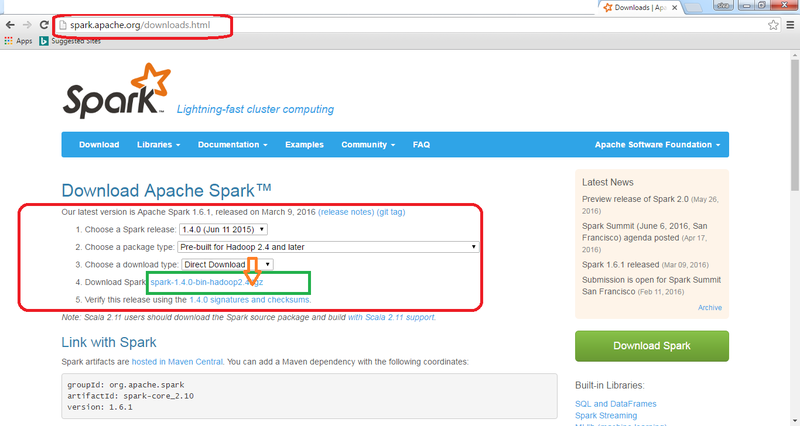 This post will explain advance topics in Spark. We will see how spark –submit will work. 1. When application submitted it launches to the driver and which will run through the application main method. 2. This Driver process could decide submitting machine or distributed cluster on master node, it is depending how it is submitted. 3. Then Driver asks the Cluster manager to specify the amount of resources. As long as resources are available. Cluster was spend them up to use. 4. Then Driver will run through the main application to building up the RDD until it reach action. Which causes the Driver to trigger the execution of the DAG and manage the work flow. 5. Once that completes the driver continues to the main code until the entire execution done. At that point resources are cleaned up. However this resource clean up could occur before the Driver completes. If the Spark context start method called before that. 1. What is cluster Manager? - It is distributed tunnel and like a model data center. - One machine is referred as cluster manager- which is responsible to manage other systems. 2. 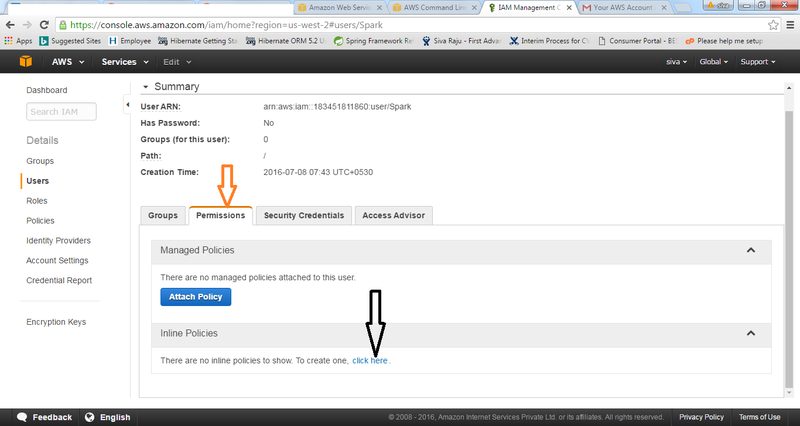 Primary cluster managers used for spark. - Spark will have it’s own built in manager called spark standalone. 1. 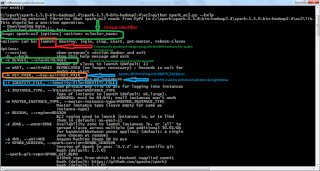 To configure Spark standalone each machine required compiled version of spark. 2. 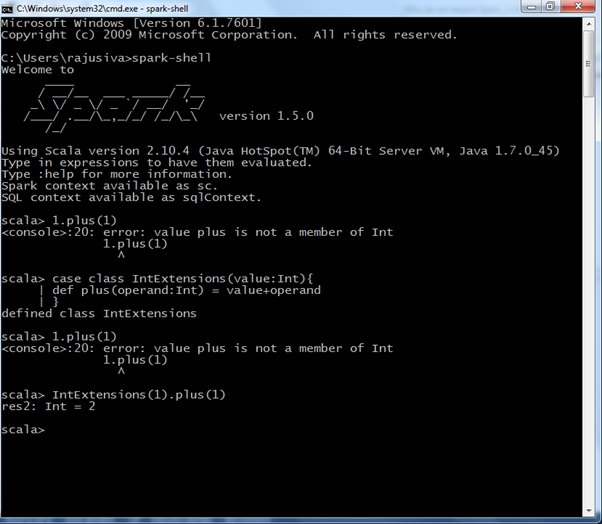 We need to configure $SPARK_HOME on each machine. So they point to that location. 6. 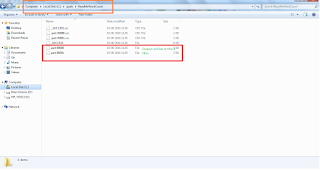 If it’s not found these slave address files, then it will take from localhost. ./sibn/start-all.sh to start the spark process. 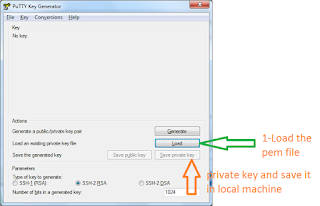 It requires password less ssh directory. 1. 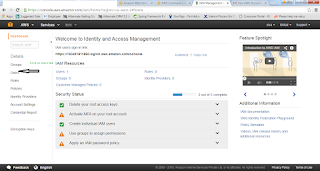 To work with ec2 cluster environments we need AWS_ACCESS_KEY_ID and AWS_SECRET_ACCESS_KEY. For this we need to be register the same. 2. 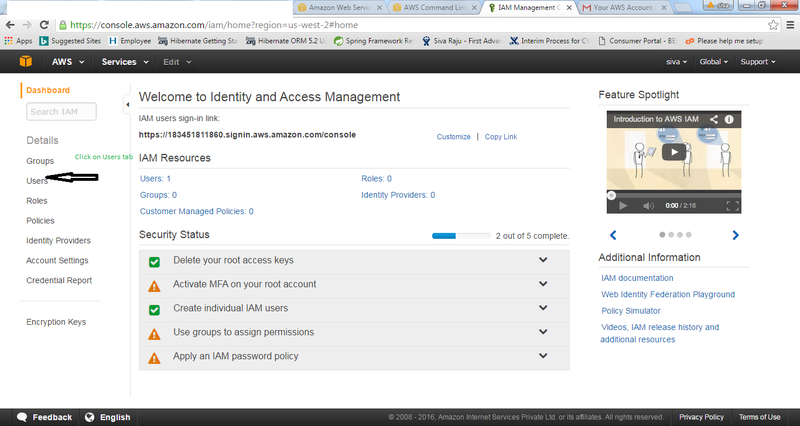 First open the https://aws.amazon.com/ in browser. 6. In this home we page we will have download link for our respective systems. 7. Here I have downloaded 64 bit windows installer and installed the same. 8. 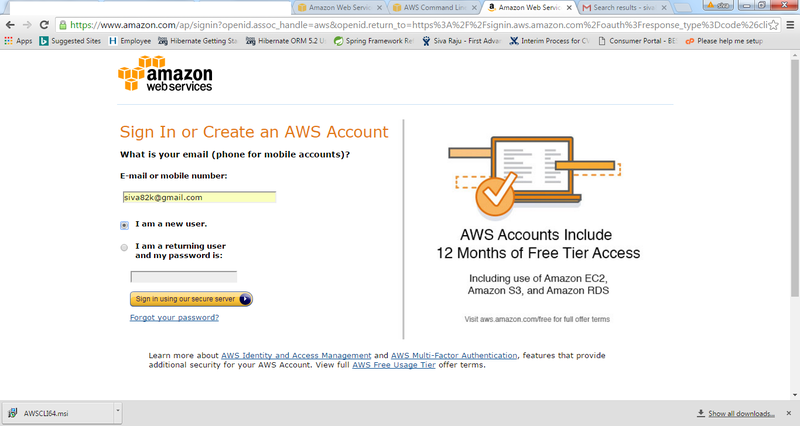 Now go to https://console.aws.amazon.com. If you don’t have account create the same. 9. 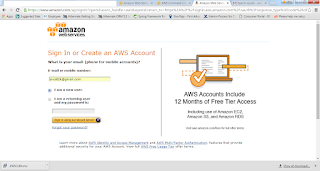 Please follow the instructions which is displayed in amazon sites to register successfully. 10. 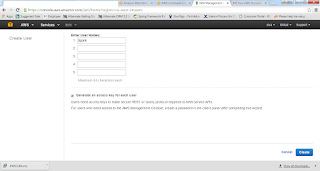 Once your registration successful, then login into the aws console. Page should look like this. 14. 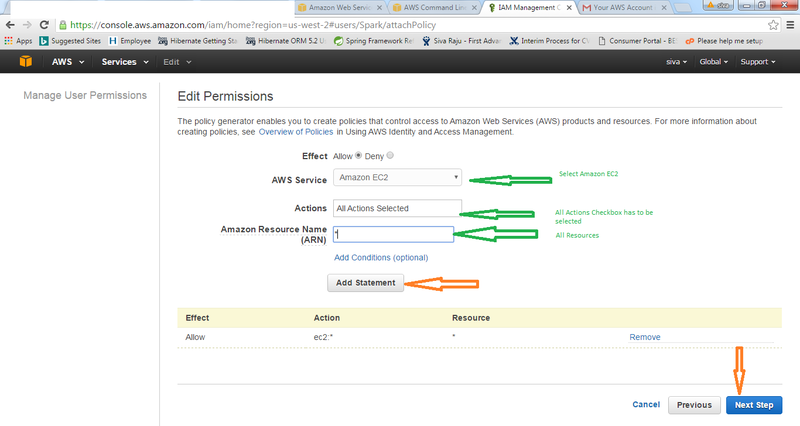 This key information needed to access AWS functions outside of this web management like ec2 script or CLI. 15. 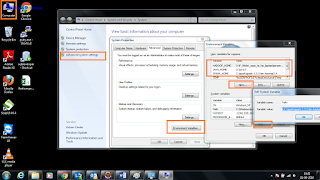 Once we have created then we can show the Credentials, it copy or Download as CSV. 16. It will be available only once, if missed them again we can generate new access keys the same. 18. 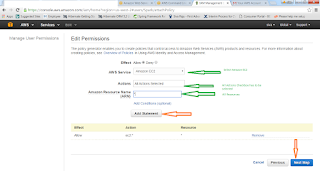 Once we have setup the permissions and policies. 3. We are the soul owner of this file. 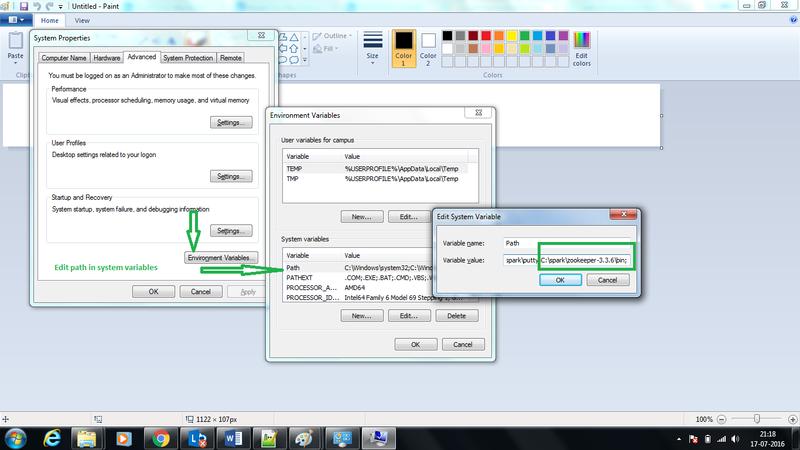 8.Load the file (.pem file) through putty gen and click on the Generate. 9.If you face any error while creating default-roles then u can download awscli version and install the same. 2. Release label- which tells the emr which version of the machine setup to use. 5. We will specify bootstrap with the spark application. 7. 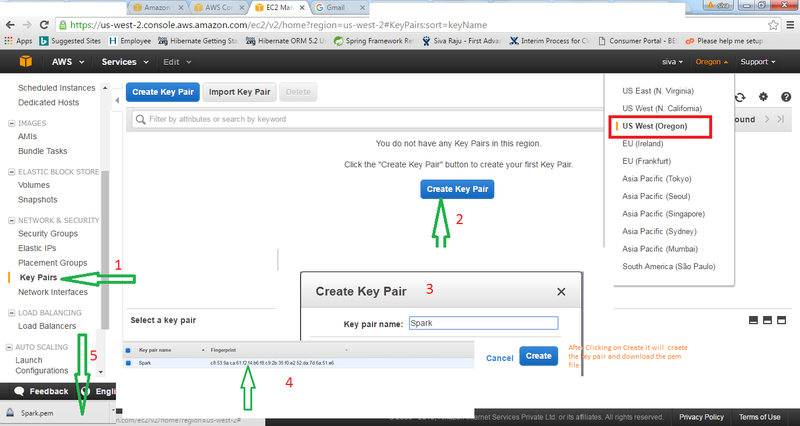 We will specify the key pair name which we have created. 8. Once we have successfully submitted then we will get back the cluster id, which is useful to make CLI calls in future respect to this cluster. 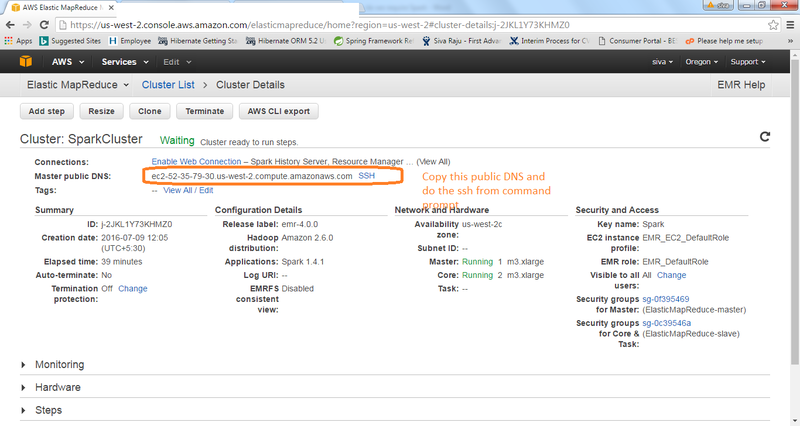 1. once cluster started then we need to copy the master PUBLIC DNS to do the ssh from our environment to cluster. 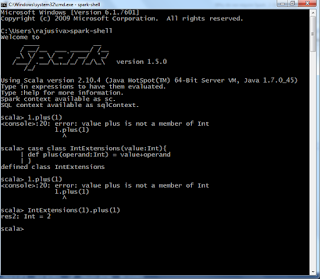 Once spark shell executed in EMR, then we can execute all the actions in EMR. 1. 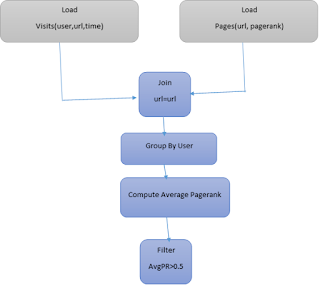 We can monitor and maintain spark applications using tool called Spark UI. 2. We need to configure browser to handle the proxy for ssh connections. The above code is not looking good. So we will use implicit conversions. If we use scala> 1.plus(1) – result will be 2, Since internally conversion happened. If we see the above data we will have same key and different data for few of the keys. 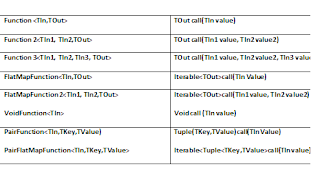 If we see the above tables data, same key and values will be stored in same node. So it easy to us to pair the key and values. 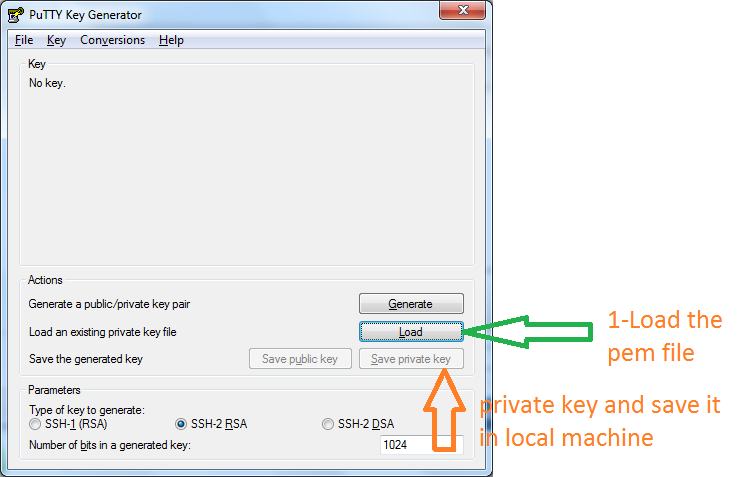 4. reduceByKey- it is same as key. But it is transformation instead of action. Since we are having all the keys in same machine, we can work with same worker instead of going back to driver. 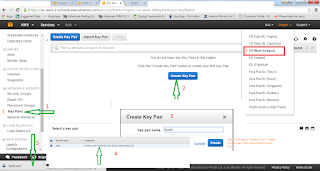 8. groupByKey – It is same as using group By method. 1.It’s ability to store intermediate data in memory while keeping distributed that allows possibility of a 100 times performance gain when compared to Hadoop. 3.Suppose we have 1 RDD, use Thread.sleep , performance algorithm to get the result and create one more transformation and final result will be given below. If we want to run another transformation , then it will call from cache. - Org.apache.spark.storage.StorageLevel.MEMORY_ONLY- it is default option and it means data will be cached into memory . - MEMORY_ONLY_SER- if any memory issue we can serialize the data. - …_2 – all these options appended with _2 , So the data will be replicated with another worker. - This required to computation upon failure.as the DAG scheduler opt’s for the alternate storage location, which will re replicate the data. - OFF_HEAP- which will store the data in memory of the JVM Heap. - NONE – the default storage for any RDD. c. Unpersist(blocking:Boolean=true) – to clear the cache.- No need to call explicitly once RDD is out of scope then automatically clear the cache.  1. We have seen so many methods either transform or action on RDD.  2. 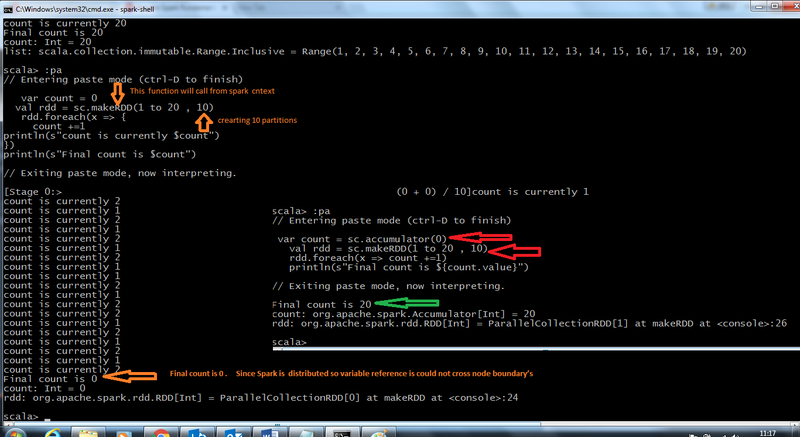 Accumulator is nothing but to accumulating the values for the shared variables across all clusters. If any worker goes down, then already accumulated value will be there with Driver. If again new worker start and picks the down node, then again it will accumulate the value. It is mismatch. For this we have to find the error accumulated. 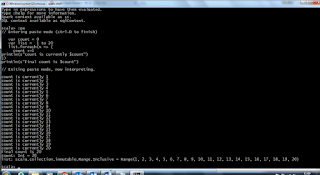 Case _=> errorCounterAccumulator+=1;  // This will useful, do we need to store accumulate the value in case of error or not. In Java 8 we have Lambdas. But before that we have no lambda expressions. 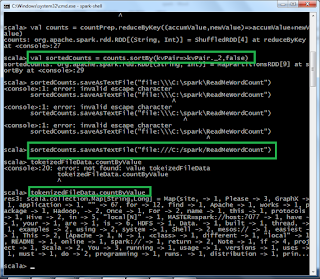 For this we need to write different syntax in Spark RDD. Why do we require Spark? If we want to run streaming data, then we need STORM. Like this we need different frame works to run the different big data items like Hive, Scalding, HBase , Apache DRILL, Flume,mahout and Apache GIRAPH to unify all these things Spark came into picture. Every three months , they will have releases. 1. IOT – internet of things- fairly large amount of data. 2. Spark unified data flatform. Apache Spark You tube channel. Every Action is fresh submit. b.If any method returns another RDD, then it is transformation. 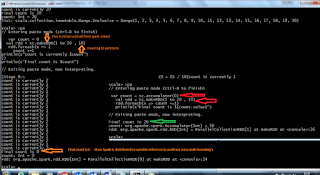 mapFunction- transformation function. This is repeated across all the nodes. Instead of repeating all the same data in all nodes , we can avoid configuring mapItemsFunction(items) Ex:instead of creating DB connection each node we will have single DB connection. RDD Combiners We will have mongoDB RDD1 and HDFS file System RDD2, to combine both RDD’s we can use UNION to combinedRDD We can use ++ operator to combine two RDD’s Intersection -RDD1.intersection(RDD2), to get the distinct values from 2 RDDS. Substract - one RDD have only unique values to another RDD Cartesian – One RDD will take each element in another RDD will compare with all possible RDD pairs Zip- Both RDDS should match same no of elements and same number of partitions 2. Actions a. Transformations are lazy and keep the data as distributed as possible. b. Actions typically sent results back to the Driver. 1. Associative Property 2+4+4+7 we can add this values in one go or (2+4) + (4+7) It is nothing but, however we are doing the action, result should be same. Acting on Data Data is distributed on different clusters, If we collect all the data and send to driver, there may be out of memory exceptions. Instead of that we can use take(5), each time once 5 records moved to Driver for computation , then again 5 records will take and send to driver and Driver keep it in Array format for final computation. Persistence Saving data no need to go to Driver. It can directly Store into any DB like 1. Cassandra 2. mongo DB 3. hadoop HDFS 4. 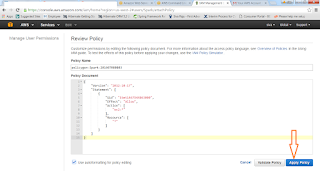 AMAZON REDSHIFT 5. 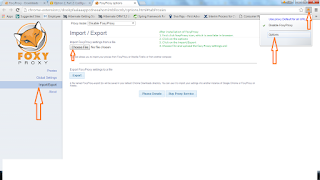 MySQL To save the Data we can use different formats 1. saveAsObjectFile(path) 2. saveAsTextFile(path) 3. ExternalConnector 4. Foreach(T => unit) foreachPartition(Iterator[T]=>unit) - Thank you very much for viewing this post. What is the Need of Pig? 1.Who don’t know java , then can learn and write Pig script. 1.It is desirable to have a higher level declarative language. 2.Similar to SQL query where the user specifies “what” and leaves the “how” to the underlying process engine. 2.Can take any type of data like structured or semi structured data. 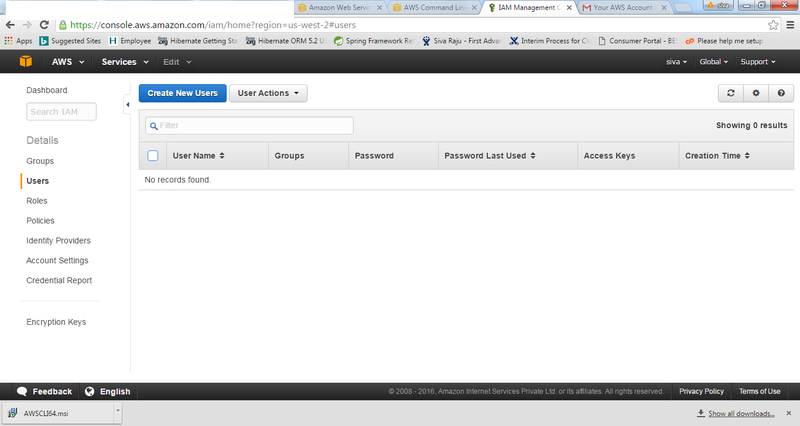 5.It provides common data operations filters, joins, ordering etc. and nested data types tuples, bags and maps, which is missing in MapReduce. 7.Open source and actively supported by a community of developers. Where should we use Pig? Where not to use Pig? 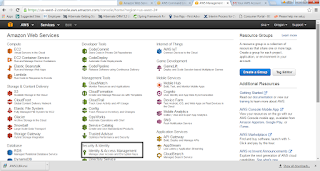 2.Perfectly implemented MapReduce code can sometimes execute jobs slightly faster than equally well written Pig code. 3.When we would like more power to optimize our code. 1.Companies like Yahoo, Google and Microsoft are collecting enormous data sets in the form of clicks of streams, search logs and web crawls. 2.Some form of ad-hoc processing and analysis of all this information is required. Where we will use Pig? 3.Support for Ad hoc queries across large datasets. 4.Quick Prototyping of algorithms for processing large data sets. 2.These logs are undergo a cleaning steps where boots, company internal views and clicks are removed. 2.Pig integration with streaming makes it easy for researchers to take a Perl or Python script and run it against a huge dataset. 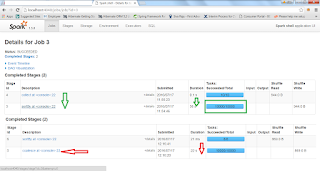 3.De-identify columns based on configurations and store the data back in csv file using Pig script. 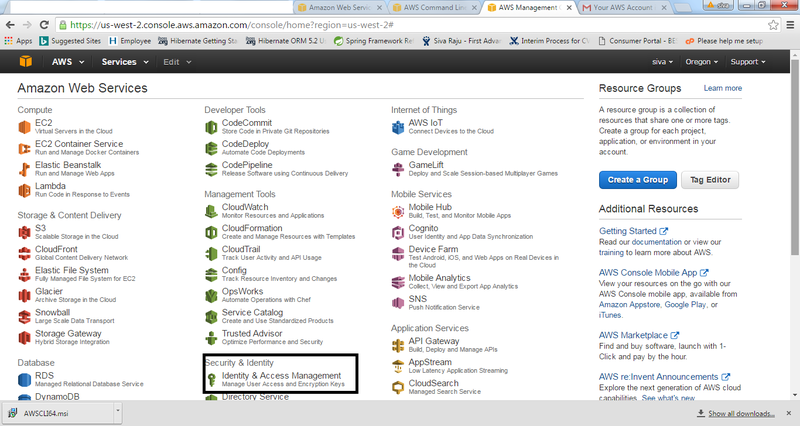 4.Store De-identified SCV file into HDFS. 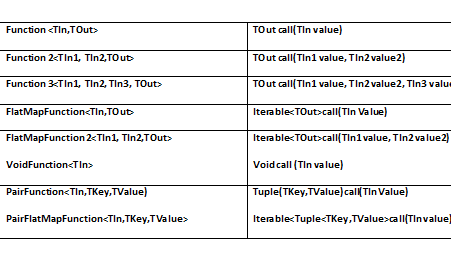 Pig – Basic Program structure. Ex: pig script.pig runs the commands in the file script.pig. 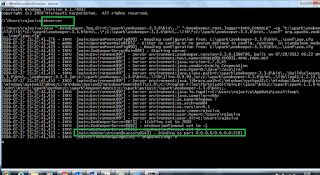 1.Grunt is an interactive shell for running the Pig commands. 1.Embedded can run Pig programs from Java , much like we can use JDBC to run SQL programs from Java. 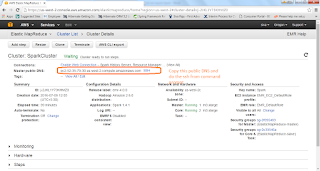 3.We no need to install any extra on Hadoop cluster. 1.It is made up of series of operations or transformations that are applied to the input data to produce output. 2.Pig turns the transformations into a series of MapReduce Jobs. d)A Data Map is a map from keys that are string literals to values that can be any data type. 2.Untar the same and place it where ever you want. add the below type of data in A.txt file. 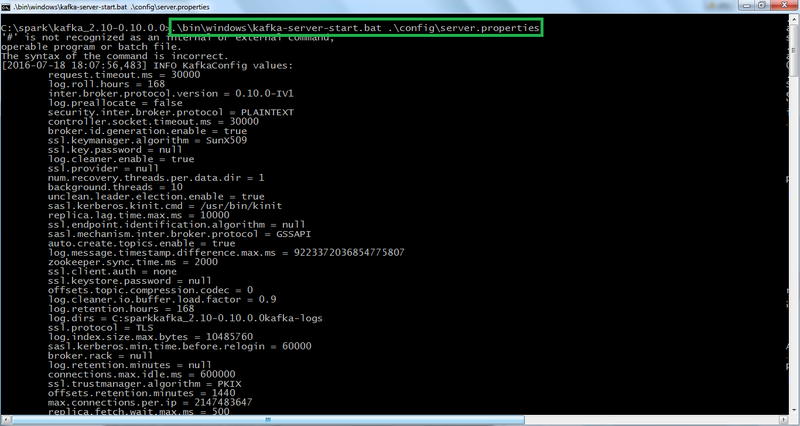 10.We will get Grunt shell, using grunt shell we will load the data and do the operations the same. And load the data again using grunt shell, then union the a,b files . then combine 2 files using UNION and then dump the C. This is how we can do the load the data instantly. c.FOREACH .. GENERATE – Adds or removes fields from a relation. d.STREAM – Transforms a relation using an external program. a.JOIN – Join two or more relations. b.LIMIT – Limits the size of a relation to the maximum number of tuples. b.SPLIT – Splits a relation into two or more relations. 1.In Pig , when a data element is NULL , it means the value is unknown. 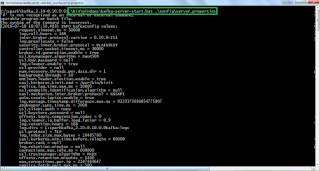 4.CSVLoader – Loads CSV files. 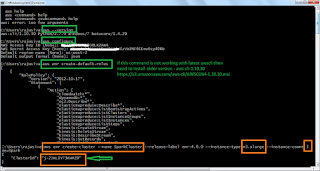 5.XMLLoader – Loads XML files. 2.JOIN creates a flat set of output records while COGROUP creates a nested set of output records. a.DESCRIBE – Print’s a relation schema. 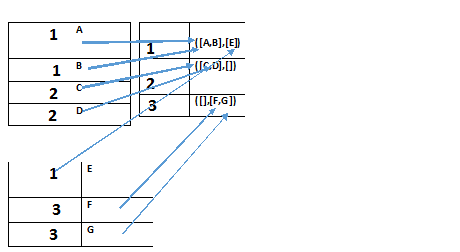 c.ILLUSTRATE – Shows a sample execution of the logical plan, using a generated subset of the input. 2.Pig itself come with some UDF’s. Few of the UDF’s are large number of standard string –processing, math, and complex-type UDF’s were added. //We need to add the below command to the script file. Create User defined function using java. 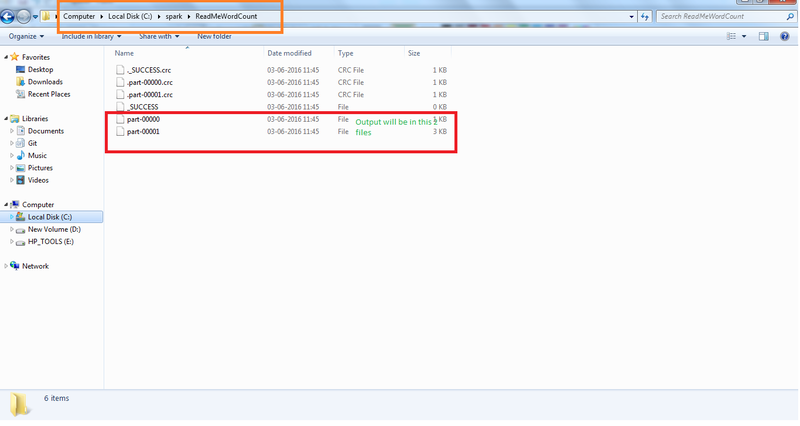 Once done the coding , then we need to export as jar. Place it where ever you want. How to Run the jar from through pig script. 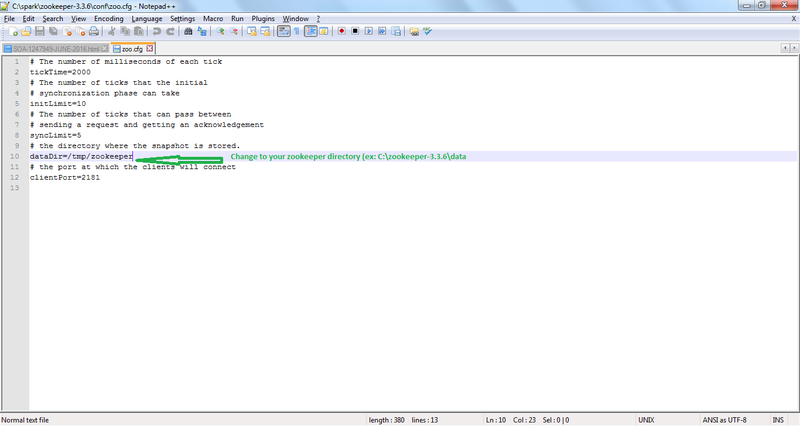 Run the UDF script using the following command. 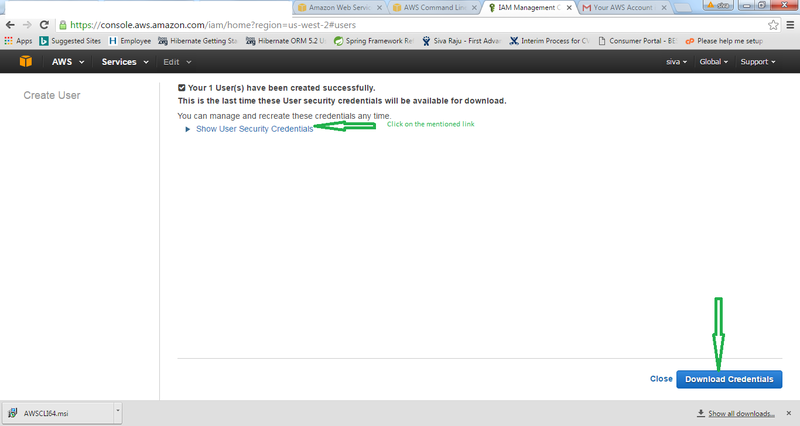 4.Click on the Download Spark. Step 2: After successful Download, we need to run the spark. For that , we need to follow few steps. 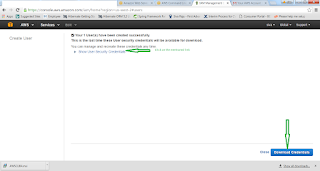 1.Install Java 7 and set the PATH and JAVA_HOME in environment variables. 3. 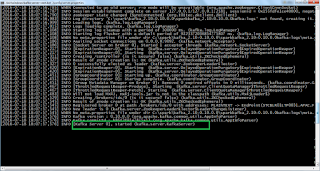 Untar the tar file and set the HADOOP_HOME and update the PATH in environemnt varaibles. 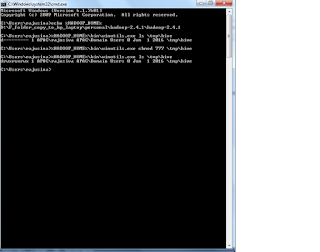 4.If Hadoop not installed then download the winutils.exe file and save in your local system. 5.After downloading set the HADOOP_HOME in environment variables where our winutils.exe file resides. 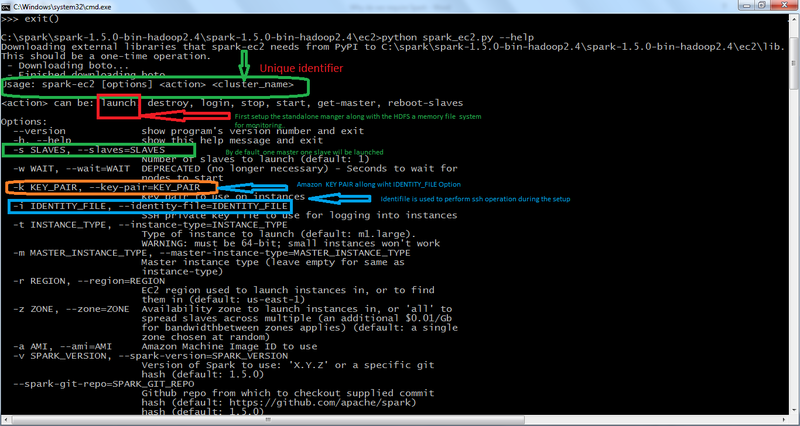 Step 3: Once everything has been done, then now we need to check spark has been working or not. 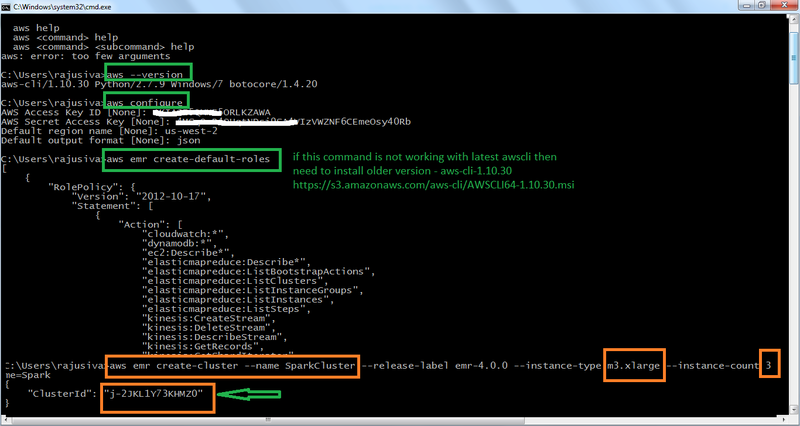 spark will start and with lot of logs, to avoid info logs we need to change the log level. 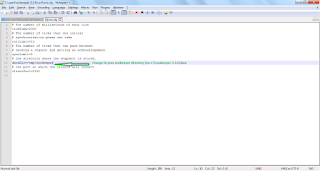 1.Copy log4j.properties.template and paste in same location and edit the same. 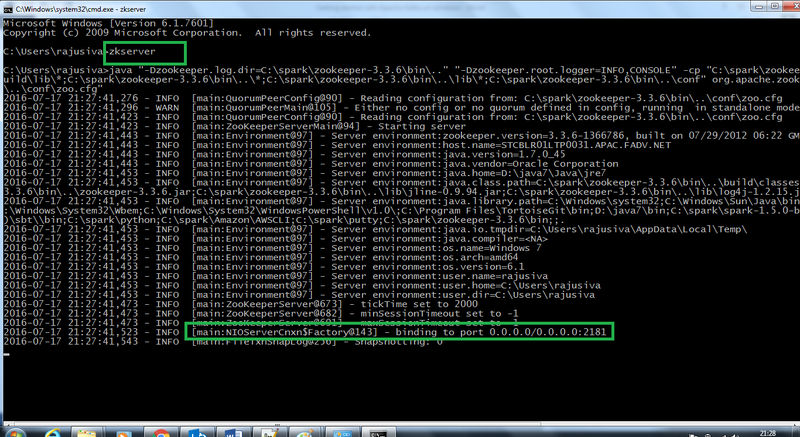 Step 5: After changing the Log level, if we try to run spark-shell, again from command prompt, then you can see the difference. 1.This is How we can install the Spark in windows environment. 2.If you are facing any issues while starting the spark. Step 6: Now we will check word count example using spark. 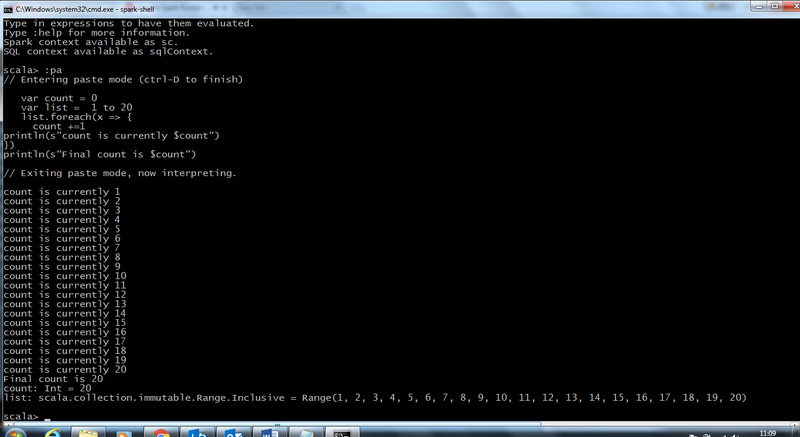 How we usally do in Hadoop Map reduce to count the words in the given file. 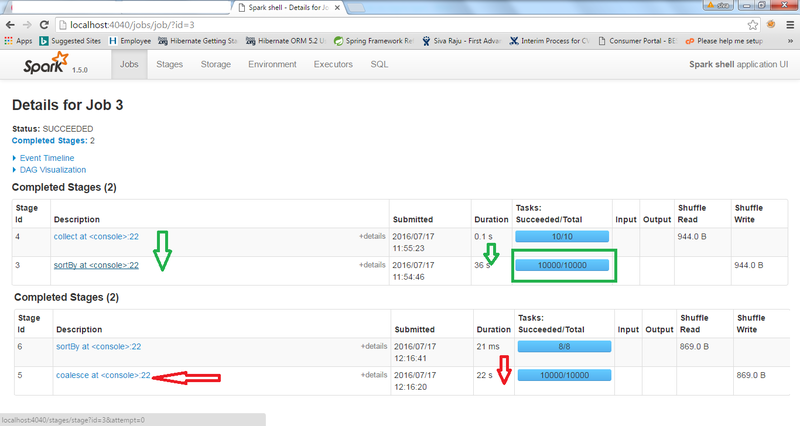 1.After spark-shell started we will get 2 contexts, one is Spark Context (sc), SQL Context as sqlContext. 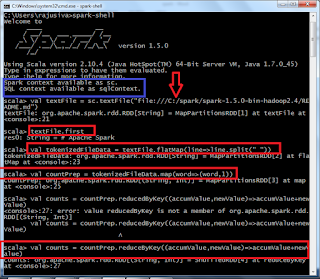 2.Using the spark context sc, we will read the files, and do the manipulation and write output to the file.